We will be setting up our stall on Sunday 29th May 2011 at Sheridans Cheesemongers’ Irish Food Festival, at their Co. Meath headquarters. 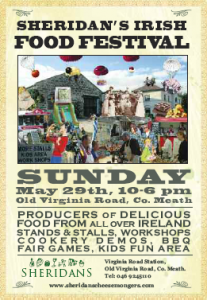 It’s the second Festival they’ve held – the first was last year, and was a huge success, with 40 Irish food producers showcasing their produce, and nearly 4,000 people attended to sample the best of our artisan food. This year there’ll be even more producers from all over Ireland showing a huge range of artisan products, from cheeses to chocolates, from pâtés to pickles. Cookies of Character will be giving tastings of most of our range of hand-made cookies, and we’ll have some specially-made limited-edition stuff too. Our Gingerbread Men will be making their first appearance outside Co. Cork, and we’ll be selling our whole range at special Festival prices. As well as the Food Producers’ stands, there’ll be cookery demonstrations, food workshops, a barbeque, a ‘fun area’ for kids and all sorts of sideshows and games. Sheridans’ HQ is in the restored Virginia Road railway station complex, midway between Carnaross and Virginia – part of the old Great Northern Railway branch line from Navan to Oldcastle, which was closed to passengers in 1958, and completely shut a few years later. The stone-built station buildings and goods shed, dating from the 1850s, stood abandoned for many years, gradually becoming more dilapidated and derelict, until they were rescued by Kevin Sheridan, restored and given a new lease of life as Sheridans Cheesemongers’ warehouse and specialist food shop – winning an award from An Taisce in the process. 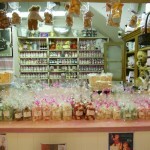 There’s more information about the 2011 Irish Food Festival on the Sheridans Cheesemongers website, as well as some pictures of last year’s event – there’s a ‘handy link’ to Sheridans on our “where to buy” page. We’ll meet you at the station! The opening of a new speciality food shop in Cork is an event worth marking, but just before Easter there were two of them – although the shops are very different from each other they both stock Cookies of Character. The first to open was in the English Market: “Sweet Paradise”, next to the Princes Street entrance, sells an amazing array of French and Irish sweet things – nougats, caramels, dragées, cookies and biscuits (French sablées and wafers as well as Cookies of Character), fudge and chocolate-covered dried fruits, and is probably unique in Ireland. 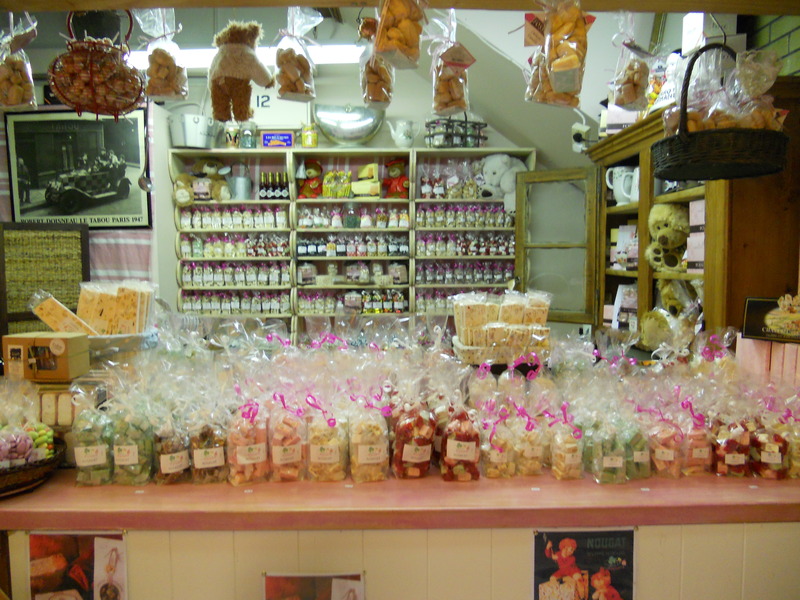 The wonderful pastel shades of the bags of nougat are in striking contrast with the neighbouring stalls! 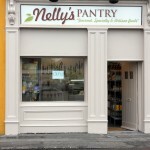 It is run by the same people who have the excellent Creperie in Schull, West Cork, and we hope it has the same success. 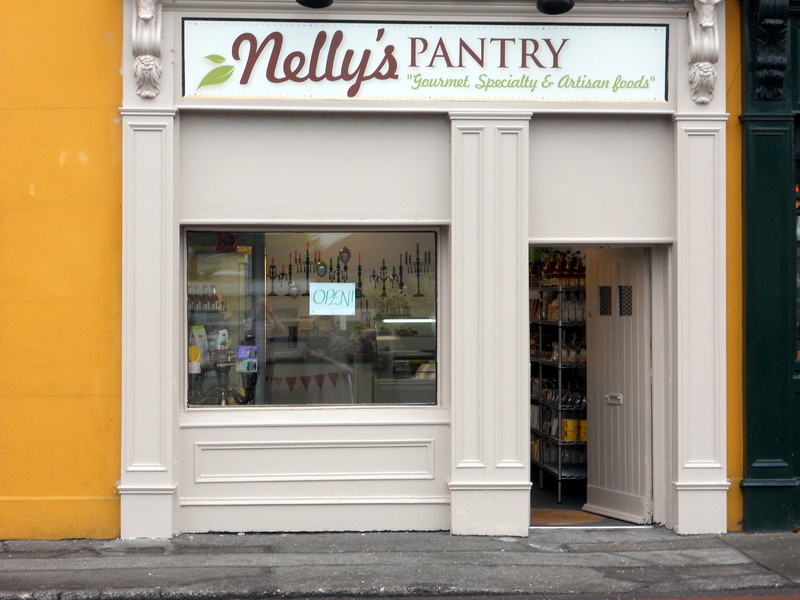 The second was “Nelly’s Pantry”, which opened just before Easter on Bishopstown Road, next to the Bishopstown Bar. Owner Lynn MacCarthy describes her shop as stocking “Gourmet, Specialty and Artisan Foods”, and she has a huge range for fairly small premises – and still found room for a coffee machine. Cork producers are well represented, including both sweet and savoury baked specialities (some of them gluten-free), meat and fish products and ready-to-eat goodies, as well as Kerry artisan ice-cream, lots of speciality groceries and of course Cookies of Character. Lynn opens at 7.30 in the morning for coffee-to-go, and doesn’t close until 7.00 p.m.